It's ok, he'll land on his feet. Unless you are extremely successful – or have married a hedge fund manager – chances are that you think about money. The nature of the classical music industry (although this is true for freelancers in general) makes it difficult to budget very far into the future: Income is not only sporadic, but the larger these sporadic fees become, the easier it is to incorrectly view them as windfalls. There have been seasons that I made upwards of 30% of my income in the month of December alone! If you sing operas, you might make $15,000 in March and nothing for the next five months. This can be problematic for obvious reasons. 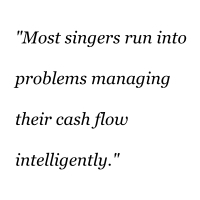 I would suggest, however, that most freelance singers run into problems not with their quantity of income, but rather with living within their means and managing their cash flow intelligently. I know… more income generally does solve financial problems, but there are ways to plan effectively for irregular income; and, the exercise of looking at your entire financial picture will strip you of the sort of wild spending that results from feeling desperately out of control. The biggest threat to a healthy cash flow is monthly debt payments. Most of us will have to take on student loans at some point. Fine – hopefully you consolidated at a low rate. Credit cards are the real killers. I know that hating on credit cards is la mode these days (I have felt my share of irrational exuberance), but you should not mortgage your life for the career that you are going to have. You could box yourself into a situation that ties you to a crappy day job just to pay off said debt. That crappy job makes working towards a singing career even more difficult! So, you do not need the fanciest new anything. You do not need to take on loads of debt for an audition tour. 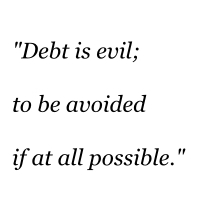 Debt is evil; to be avoided if at all possible. You would be better off saving towards these goals. There are singers that successfully use credit cards to manage monthly expenses, but be cautious and have a plan. If you are in a heap of credit card debt, don’t despair, listen to Dave Ramsey. The following tips might sound impossible to adopt. Just remember that anything you do to move in this direction will help. Start small if you need to, just start. First, think of yourself as a business. 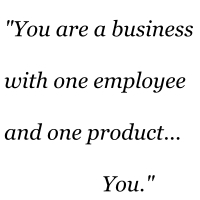 You have one employee, one stockholder, one CEO, and one product: You. Open a few new bank accounts: One checking for your business (doesn’t need to be a business account), one personal checking, one savings for taxes, and one personal savings. You should be able to find a bank that offers these accounts with no fees. Second, feed the government/feed your piggy bank. Your singing income is going to be deposited into your business checking account. Deposit (and declare to the IRS) everything, including cash payments from gigs and lessons. This is not only the right thing to do (morally and civically), but the IRS will nail you if, after your deductions, they think that you don’t have enough income to live on. At the ATM you will immediately transfer 10-15% of each deposit to your tax savings account. (If you have last year’s tax return, do the math to figure out how much you should be setting aside.) Then, transfer the same amount to your personal savings account. This money is gone. You do not have access to it. It is not part of your available spending cash. Once you have enough in your personal savings account, open a Roth IRA and continue contributing to it. Look at the next twelve months worth of work, add up your income, subtract your tax and personal savings, and divide by twelve. This is the monthly salary that you will pay to your personal checking from the business account. As time passes, you will adjust this monthly salary to reflect new additions to your calendar. If this is too depressing an exercise, that means that you are living beyond your means. The good news is that now you can now plan your way back to fiscal responsibility, rather than be surprised by a financial crisis in the future. Your potential responses are 1) be motivated to get better gigs – have you been putting off getting head shots, setting up auditions, triangulating on conductors, etc… 2) start living as though you were as poor as you actually are – are you eating out a lot? Spending money on the road that could be saved instead (*more on this below)? 3) Hang up your hat – there is no shame in this! The world needs educated audience members. Third, there are many theories about how best to manage the money you do have – find a simple one that you can stick to. I like the envelopes system (Dave Ramsey is a famous proponent of this), although I use a hybrid of a detailed quicken file, a cash envelope system, and a spreadsheet… message me if you are curious. Basically, figure out how much you will spend per month on all of your expenses, withdraw that much cash once a month, and distribute it into envelopes – one envelope for each budget category. This works less well for the gas bill, which is best paid online, but it works really well for groceries, personal care, household items, pet care, etc… That way you know how much money you have left in each budget category, and the fact that you have to plan out your shopping trips (to make sure you’ve stopped at home to get the cash) decreases impulse buying. Most importantly, you are spending money that you have already earned. Some people are able to just use a debit/credit card and keep such a good budget that they don’t overspend, but most of us don’t have the time or energy for that. Plus, the tangible quality of cash makes you think before you spend. The other advantage to this system is that some categories (pet care, auto, per diem on the road, other professional expenses, for example) can be allowed to accumulate a balance. That way you will never be surprised by a $600 car repair or a $500 photo shoot, since you have been putting $X a month into that envelope and the money is already sitting there. Fourth, I would suggest that you embrace the concept of an adult allowance. Snicker if you wish; it really works. Basically, find an amount of money per week (perhaps $25-40) that you can live on for ‘fun money.’ If you want to do something expensive (go out to a nice dinner, for example), use your allowance. This addresses two issues. 1) It obviates any guilt that you might feel for spending money on stupid stuff. 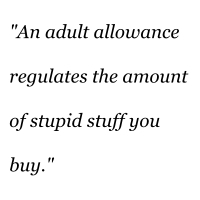 2) It regulates the amount of stupid stuff you buy. If you really want a new widget, perhaps you need to buy fewer lattes for a week. The adult allowance system allows you to have guilt free fun in a predictable manner, without wrecking your budget. 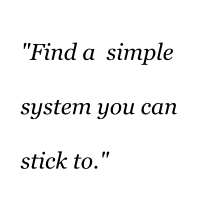 Lastly, you need an accounting system of some sort. Even though it is just awful at doing what freelancers need, most people use Quicken (heads up, Quicken essentials for Mac will NOT give you a cash flow forecast; it is useless for freelancers, slog through Quicken 2007 instead). 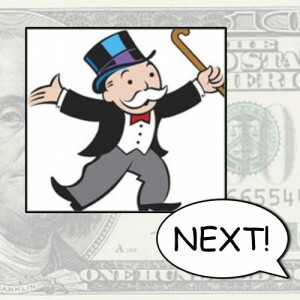 Some other options that I have played with are Moneywell, iBank, and Mint. The real short coming of Quicken IMHO, is that it doesn’t link the budget you make to your cash flow forecast. If that doesn’t make sense, don’t worry, I am a little obsessed with Quicken. Seriously though, use a paper ledger if you want. You just need a system that you can interact with on a regular basis, that can project your cash flow for at least a year. What I like about the envelope system is that any money that is actually left in your accounts is a buffer. Theoretically, all the money that you are going to spend is ‘spent’ when you withdraw the cash at the beginning of the month. Add to that a general lack of education about the specifics of the tax code, and it is easy for singers to blindly spend away much of their income (with the intention of deducting it all). The irony is that in most cases you will be better off spending as little as possible on the Business of You, deducting what you can, paying taxes on the rest, and saving the left over money. You should invest in your business, just avoid spending money when you do not have to. For example, because the IRS only allows you to deduct up to 50% of your food expenses on the road, and because your tax rate is likely going to be very low, you are better off eating frugally (and deducting that frugal eating) than overspending to go for a larger deduction. You end up with a slightly higher tax burden, but way more money in your pocket – which allows you to not only save for the future (think house/baby), but weather dry spells. I wonder how many fabulous young singers had to get out of the business when the great recession/financial crisis of the late 2000′s hit? When I am on tour, I tend to buy my food at grocery stores. It is cheaper, and the food healthier than what you would find in restaurants anyway! Win/win. Error: Unable to create directory uploads/2019/04. Is its parent directory writable by the server? Ian Howell is a countertenor based in Boston, Massachusetts. He regularly performs as a concert and operatic soloist all across North America and writes from time to time. He was educated at Yale and Capital Universities, sang with Chanticleer from 2000-04, and is currently a Doctor of Musical Arts student at the New England Conservatory of Music. Follow him on Twitter or Facebook. Very thoughtful piece. Shows what good husband material you are! Best Wishes. Copyright © 2019 The Countertenor Voice. All Rights Reserved.